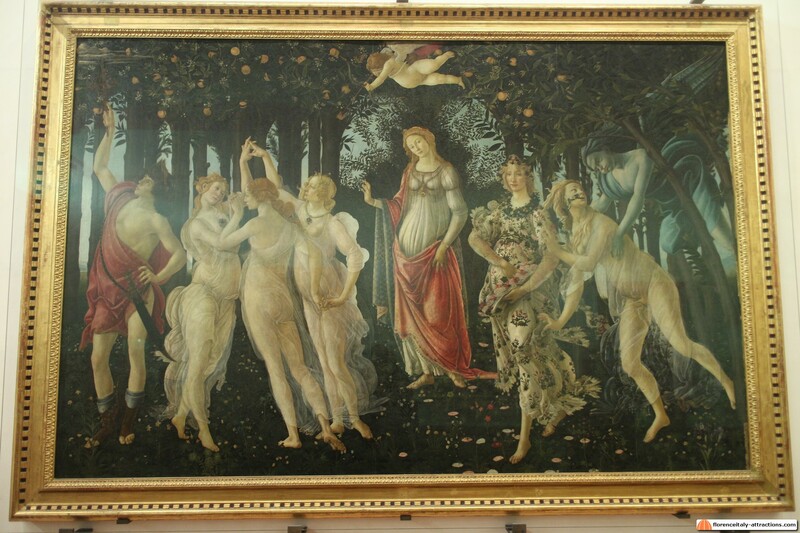 Botticelli Primavera (also known as “La Primavera”) is considered one of the masterpieces of the Italian Renaissance. Who visits the Uffizi Gallery in Florence is fascinated by this great painting, but the charm of the picture is also due to the aura of mystery that surrounds the work, whose deeper meaning has not yet been fully revealed. The work, maybe the most famous by Sandro Botticelli, together with his Birth of Venus, was made around 1477-82 and several sources have confirmed that it was executed for Lorenzo di Pierfrancesco de ‘Medici (1463-1503), also known as Lorenzo il Popolano, second cousin of the Magnificent. 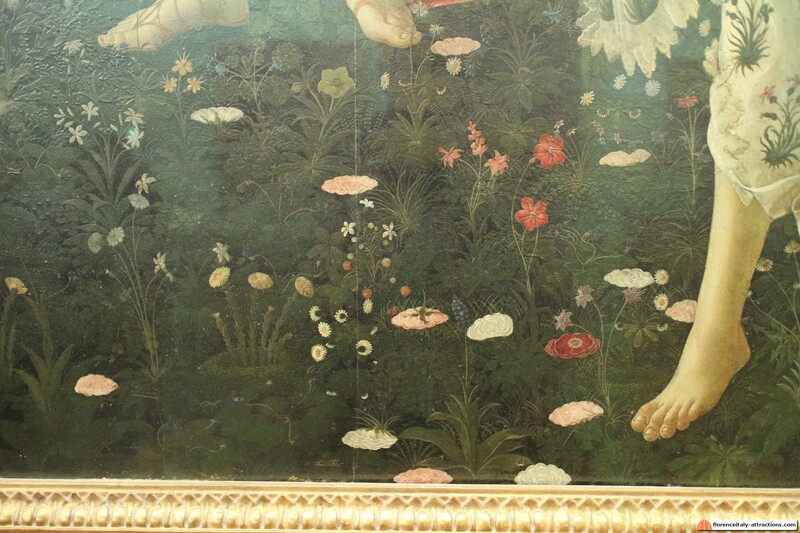 Unfortunately, for this painting we don’t have many references, unlike for many others: in Vasari’s Lives, the main direct source for Renaissance art, the work is described as an allegory of Spring (that’s the meaning of Primavera) and we know by an inventory that it was in the Medici Villa of Castello around 1501. Botticelli Primavera represents a grove formed by orange trees in front of a blue sky background; nine characters are arranged in a composition that revolves around the central one, a woman with a red cloth. 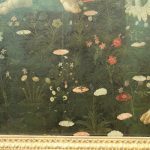 They all stand on a lawn made of numerous species of plants and flowers (more than 100 existing species of flowers were identified in Botticelli Primavera). Botticelli Primavera hides various reading levels: one is strictly mythological, whose explanation is now unanimously shared; one is philosophical, mainly linked to the neo-Platonic philosophy of the academy; a historical-dynastic reading, linked to contemporary events and to the gratification of the client and his family. The overall meaning of the work is still rather obscure and open to many interpretations. According to the mythological interpretation, characters are located in the famous garden of the Hesperides, the first from the right is Zephyr, the wind of February announcing Spring, who kidnaps the nymph Chloris; according to the myth, by this act the nymph is reborn and becomes Flora, the Goddess of Spring, represented as a pregnant woman covered by a flowered dress and spreading flowers on the ground. At the center of the picture is Venus, highest symbol of neo-Platonic love, observing the whole scene. Her son Cupid is flying above her, blindfolded, shooting one of his arrows to the left, where the three Graces are dancing. On the extreme left, you can see Mercury/Hermes, the messenger of the gods, depicted with wings on his feet, dispelling the clouds with his Caduceus to keep an eternal spring. 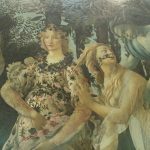 As for the philosophical interpretation, Botticelli Primavera is directly related to the circle of philosophical neo-platonists frequented by Botticelli. From this point of view, Botticelli Primavera is the representation of Venus after birth, during the arrival in his kingdom. According to another philosophical interpretation, Botticelli Primavera represents love in various degrees: pulling the man from the earthly world means turning it into spiritual: Zephyr and Chloris represent the strength of sensual and irrational love, but it is a source of life (Flora) that, thanks to the mediation of Venus and Cupid, turns love into something more perfect (Graces), flying to the heavenly spheres led by Mercury. According to some readings, the painting would be the mythological representation of Florentine characters and their virtues, as in a carnival parade. That’s because it seems that the work was originally commissioned to Botticelli by Giuliano de Medici to celebrate the birth of his son Giulio (future Pope Clement VII), whom he had from Fioretta Gorini that he would have married in secret in 1478. But Giuliano died in the Pazzi conspiracy, plotted against his brother in that same year, a month before the birth of the child, so the painting was unfinished and “recycled” by his cousin Lorenzo il Popolano some time later to celebrate his wedding, inserting his portrait (Mercury?) and that of his wife Semiramide Appiani (Venus? Grace on the left? ), who was an extremely beautiful woman. 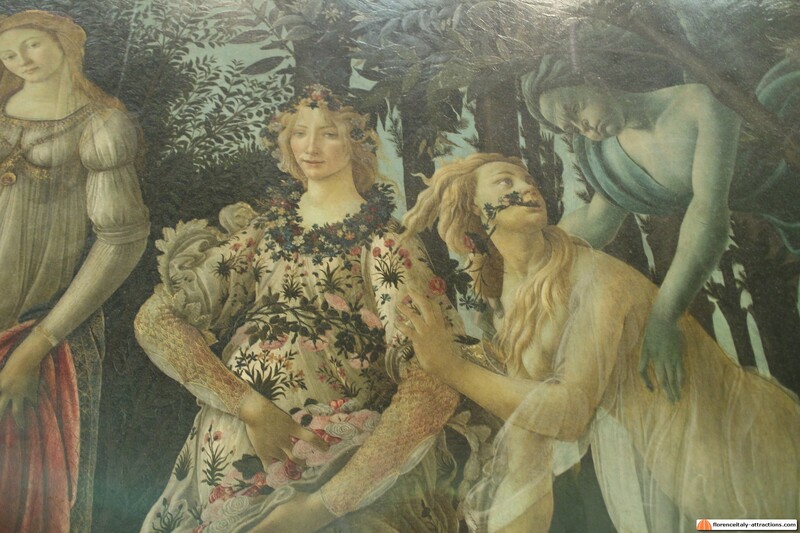 Analyzing other portraits painted by Botticelli, various persons related to the Medici family were identified in La Primavera: in particular, Caterina Sforza (Grace on the right), and (Grace in the center) Simonetta Vespucci, source of inspiration for the Birth of Venus, looking dreamily to Mercury-Giuliano de Medici. In a historical reading, you should consider the painting as an allegory of the golden age in the Medici era. 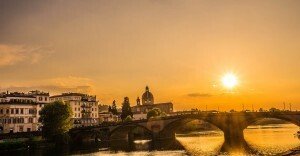 The presence of Flora would therefore be an allusion to Florentia and to the ancient origins of the city of Florence. 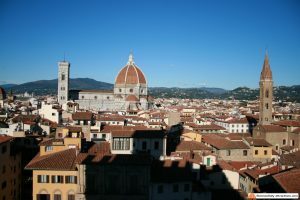 The other figures would be cities linked in various ways to Florence: Mercury-Milan, Cupid (Amor)-Roma, the Three Graces as Pisa, Naples and Genoa, the nymph Maya as Mantua, Venice as Venus and Borea as Bolzano. In my opinion: I trust the Flora as Florence interpretation but I doubt the other characters represent other Italian cities; putting the rival Venice in the center, as the Queen of the garden? I don’t think so. Other studies suggested that Botticelli Primavera is a kind of schedule of Summer: from February (Zephyr) to September (Mercury), wishing an endless Spring.